By no means are we suggesting that NASA’s Fermi Gamma-Ray Space Telescope can induce altered states of awareness, but this ‘far-out’ image is akin to 1960’s era psychedelic art. However, the data depicted here provides a new and enlightened way of looking at an object that’s been observed for over 400 years. After years of study, data collected by Fermi has revealed Tycho’s Supernova Remnant shines brightly in high-energy gamma rays. The discovery provides researchers with additional information on the origin of cosmic rays (subatomic particles that are on speed). The exact process that gives cosmic rays their energy isn’t well understood since charged particles are easily deflected by interstellar magnetic fields. The deflection by interstellar magnetic fields makes it impossible for researchers to track cosmic rays to their original sources. “Fortunately, high-energy gamma rays are produced when cosmic rays strike interstellar gas and starlight. These gamma rays come to Fermi straight from their sources,” said Francesco Giordano at the University of Bari in Italy. When a massive star reaches the end of its lifetime, it can explode, leaving behind a supernova remnant consisting of an expanding shell of hot gas propelled by the blast shockwave. In many cases, a supernova explosion can be visible on Earth – even in broad daylight. 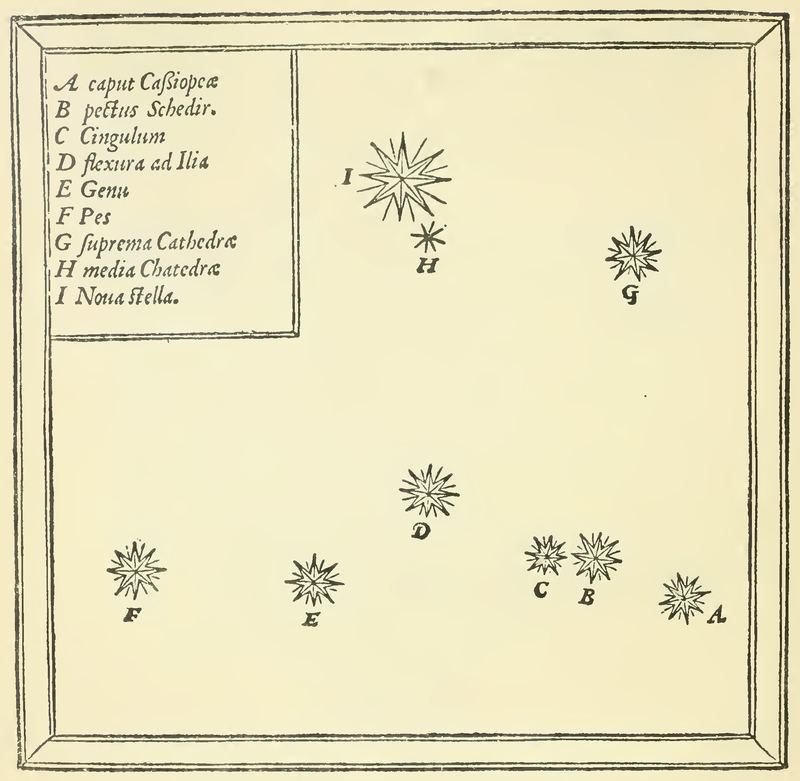 In November of 1572, a new “star” was discovered in the constellation Cassiopeia. The discovery is now known to be the most visible supernova in the past 400 years. Often called “Tycho’s supernova”, the remnant shown above is named after Danish astronomer Tycho Brahe, who spent a great deal of time studying the supernova. In 1949, physicist Enrico Fermi (the namesake for the Fermi Gamma-ray Space Telescope) theorized that high-energy cosmic rays were accelerated in the magnetic fields of interstellar gas clouds. Following up on Fermi’s work, astronomers learned that supernova remnants might be the best candidate sites for magnetic fields of such magnitude. One of the main goals of the Fermi Gamma-ray Space Telescope is to better understand the origins of cosmic rays. Fermi’s Large Area Telescope (LAT) can survey the entire sky every three hours, which allows the instrument to build a deeper view of the gamma-ray sky. Since gamma rays are the most energetic form of light, studying gamma ray concentrations can help researchers detect the particle acceleration responsible for cosmic rays. The team’s model is based on LAT data, gamma-rays mapped by ground-based observatories and X-ray data. The conclusion the team has come to regarding their model is that a process called pion production is the best explanation for the emissions. The animation below depicts a proton moving at nearly the speed of light and striking a slower-moving proton. The protons survive the collision, but their interaction creates an unstable particle — a pion — with only 14 percent of the proton’s mass. In 10 millionths of a billionth of a second, the pion decays into a pair of gamma-ray photons. If the team’s interpretation of the data is accurate, then within the remnant, protons are being accelerated to near the speed of light. After being accelerated to such tremendous speeds, the protons interact with slower particles and produce gamma rays. With all the amazing processes at work in the remnant of Tycho’s supernova, one could easily imagine how impressed Brahe would be. Fermi-LAT Detection of the Young SuperNova Remnant Tycho. I wonder how a particle comes into existence from two protons which upon collision do not lose their existence and, I guess, their mass. Some of the energy from the two protons is converted into matter particles upon collision – which is what the boffins at CERN do with the LHC. Why gamma rays are so offset from the remnant? Is it just because of our view point or it has some other interesting implications?